The 2019 Time Trial Season Calendar is now available from the Time Trial Page and all events are in the Calendar! Being at Deerhurst it seemed rude not to attend the final Cyclo Cross of the year hosted by the Western League. The course was fiendish with a steep uphill start causing a number of riders to dismount and walk. Following on was a technical descent through trees and over steps to a steep downhill into the farmyard. Through there and some gravel riding before an out and back across fields to the pits and a couple of jumps before returning to the base of the hill climb. Four laps for many, five for some in gloriously sunny weather. I managed to puncture somewhere on the final lap so had to dismount and run the final technical section and the gravel. I don&apos;t think it made a huge difference as I wasn&apos;t overtaken! The final race of the season was held at Top Barn near Worcester. The course was flat and fast with a few technical sections thrown in to slow the riders. Mostly mud free but the technical sections did start to get slippery. Most managed four laps, the leaders doing an impressive five laps as they flew around the course. That&apos;s it now for 2018. Cob House Country Park was the venue for the West Midlands Championships. On the face of it, the course looked very flat and very fast, but I should have known that the fiendish course planners would not make it easy! The start area was flat and fast giving us chance to sort ourselves out. Those with a good start had a distinct advantage. The route doubled back around a pond then over a narrow bridge into another big field where the fun began. A steep muddy bank caused most to dismount and we ran along its length before steeply climbing it, then another angled bank to run along. Very few tried to ride it. Once past that we were back on riding on reasonable grass and cinder before the real mud-fest began with a steep very muddy mound to surmount, then seriously cloggy mud, impossible to ride. Another rideable section was followed by another mud-fest before the going eased onto grass and back into the main field over another bridge. The course took us around the main field, passing the bike wash and pits which were doing a roaring trade. Sadly I only had one bike which was now caked in mud, as were my shoes, making clipping in all but impossible. Through the finish and off again for three more laps. One more event this year on the 9th December at Top Barn. Wyre Forest were the hosts for this round of the series which was held around a sports centre. The course started along a tarmac road to separate the riders before doubling back on lumpy grass to set of twists and turns to take advantage of the raised bank. Then over the boards and into a leg sapping muddy section in the centre zig-zagging across the field to maximise fatigue before exiting onto the tarmac road again. It was mostly flat and fast with the leaders catching the tail enders after three laps. Quite a drive to this one, located just North of Telford, but having missed the last few due to holidays I was keen to attend. The course utilised a Rugby club grounds and as such was mostly slightly undulating, taking advantage of slight rises for twists and turns and a muddy downhill section at the far side of the fields. A dismount was required at the man-made jumps. The day was dry and the course fast but ultimately tiring. I rode my new bike which is over 4kg lighter than my previous bike, and felt like it, added to which, I&apos;ve lost about 8kg of weight as a result of my trip to the Himalaya. Combined together I am a racing snake. Unfortunately a cough and cold transpired to slow me down a little. Still, it was an excellent return to racing. Centred at the Warwick Racecourse, the 68 mile Standard route organised by Wiggle went South as far as Shipston on Stour before turning North again to return to the Racecourse. The route kept off the main roads as much as possible, although there were two or three short unavoidable sections but were well marshalled to prevent any incidents. The second half was definitely more hilly than the first with a number of stiff climbs to test the legs. The weather was excellent, organisation first class, feed stops well planned - although why they are always in a car park with a gravelly surface is beyond me!Surely there must be more bike friendly places to locate them? I have no idea how many people rode the event but if someone told me it was a thousand, I wouldn&apos;t be surprised. I managed just under 4 hours not including stops and was clocked in at 4:06:27 which gave me a Gold Standard so happy with that. The annual BHF Sportive started as always at Cheltenham Racecourse but shortly after the start, the similarity with events of previous years came to a sharp end with a climb of Ham Hill which was a brute and seemed to go on forever. I managed to ride to the top but I passed many walking and we were only 20 minutes into the event! At the top it picked up the familiar Syreford Road and the second stiff climb out of Charlton Abbots, again passing many walking. From here it was steady rolling countryside before a stiff descend to Guiting Power, but then another good climb up to Ford. From Ford we undulated to Snowshill where the fastest downhill section came on the road to Broadway where my speed hit 75km/h. Turning left just before Broadway we rolled out to Dumbleton and then onto Winchcombe before turning back through Gretton and Gotherington and through Bishops Cleeve and back to the racecourse. I completed the 80km course in just under three hours so was well pleased with that. The weather was superb all day, the organisation perfect with excellent signage and a medal and water to finish. Sevales 2018 Reliability ride was a great success with plenty of riders out on both courses, although the long course proved the most popular by far. Split into two groups; the fast and the &apos;not so fast&apos; groups the route was a slight modification on previous years due to the start/finish being at Welland rather than the more traditional start at the Bowling Green in Malvern Link. Your reporter elected to ride the long course in the &apos;not so fast&apos; group which actually rolled along at a good speed, averaging almost 19mph and at some points considerably quicker, particularly the flatter or downhill sections around Bredon Hill. Coming out onto the main Corse Lawn road saw the only spill of the day where two riders managed to collide due to some indecision about whether to go or not. No damage done as they fell onto the grass at zero miles per hour, but some damage to egos was inevitable! As we came through Corse Lawn there was a distinct increase in pace and turning into Straight Lane down to Staunton I swear some thought it was the finishing straight such was the frantic pace. Hanging on, I managed to stay with the group as it swung around onto the Malvern Road where it eased somewhat - just as well, there were three testing uphill sections, the first coming quite soon. Getting out of the saddle and changing down, both myself and two other riders almost collided with a guy who had almost come to a standstill on the climb, but local knowledge paid dividends with a huge effort to crest the short rise and stay with the pack as it thundered down towards Rye Cross. Shortly after we were slowed by rampaging sheep (well, grazing sheep) but once past the pace rose again as we headed to the Castlemorton Climb, another relatively short one, but testing nevertheless. Picking the wrong wheel I saw a group of four or five riders pull away, so rounded my paceman and gave chase. Unable to quite get back on I saw the gap extend as we rode down to slope to the base of the final climb where my pace guy came past so I jumped on hoping for a tow up the last climb. Not to be! He slowed dramatically so I was left to chase, catching one rider and seeing two groups of two ahead, one of which contained Mike Amery. The chase was on! Welland straight is not long, but seems like it at the end of a long ride. My legs were screaming by now but I was determined to give it a go. As I closed the gap I saw Mike take his chance and go past his guy, then the lead changed again, and a third time. My gap stayed out at about 20-30m unable to close it as we crossed the village boundary. A build up of traffic slowed everyone and I closed the gap to ride in with Mike and his wheelman, happy to finish with them. A good mornings ride, good pace and a nice test for my winter training. I was happy to finish with the group, having had some doubts earlier on. Sadly due to inclement weather, the final Cyclo Cross Round at Tamworth was cancelled. So that&apos;s it for another year. Well done to everyone that rode. Next year we&apos;ll come back stronger and faster! Blackwell Court near Bromsgrove was the venue for the penultimate round of the 2017 season. A fine course and nowhere near as muddy as last week! The course was almost identical to last time we were here which is no bad thing. It features twists and turns, a ride out over a small hill, then a long sweep around a big field which is slightly uphill and always leg-sapping. Then a nice flat section to recover before heading into the main area again and a sweep down to the start field before climbing steadily again into the finish area. Due to a minor brain failure I was late to the start so started at the back of the grid which actually motivated me to try harder. Two weeks until the final in Tamworth. Baggeridge Park was back to its old state of a complete mud-fest! Right from the off we were struggling through the mud in the big field. Out of the field conditions improved and it became quite rideable for sections, although lap one saw plenty of jams and falls as riders got to grips with the slippery conditions. A slightly different, and in my opinion, better course than previous times wound its way around the park, in and out of the woods and several twists and turns near the start/finish area, some sections were just not worth riding as it was so hard going. I had to stop a few times to de-clog my bike from the accumulation of mud. At Misterton Hall near Lutterworth it was quite a drive, but boy was it a good course! In the grounds of the Hall, the car park was right next to the start. The first section was across a field and round a sweeping bend before a narrow section and into a second field before a wooded section, giving way to an uphill gravel track, then onto very soft ground before a sweeping downhill. More wooded section including a difficult uphill bend, downhill and a sharp hairpin before out onto tarmac followed by more very soft ground and another wooded section with a barrier requiring most to dismount. The route wound its way back towards the hall and the finish line. Most did five laps, the leaders six. Apparently this year was the 25th anniversary of the first Cyclo Cross on this course and thanks must be given to the owner; Heather Craven for allowing us to use this excellent venue each year. Baggeridge Park is probably my favourite course, although last year it was so muddy we had to walk to the start grid! This year the mud was almost non-existent which made a very raceable course. The start was a good length before the first turns started to slow the field with an off-camber turn proving too slippy for some. Weaving in and out of the forest and a twisty set of turns around the main field meant that the concentration had to be maintained throughout - no rest or recovery. The rain that threatened at times stayed away at least for the senior mens race. We&apos;re back here in November which may be a different proposition but next week the show moves to Lutterworth. At Shelsley Walsh, more famous for its Hill Climb, which, by a coincidence was open to cyclists on the same day as the Cyclo Cross. The course was an unforgiving one, designed and build on sloping fields which obviously meant a lot of up and down. Your reporter was suffering the after effects of man-flu so wasn&apos;t on top form but still managed a good ride. Good technique was required to negotiate the many twists and turns and places could be gained for strong uphill riding. The next event is a few weeks away, so plenty of time to get some mid-season training done. The first of the 2017/18 series kicked off at a new venue; Abbey Stadium in Redditch and an excellent course it was too! Mind you, it was slippery in the rain with the first crash occurring just 100m from the start line, followed by the second 50m later! The course twisted and turned up and down, but always raceable. One section featured an off-camber section to the right then immediately the same but to the left - care was needed with several riders coming a cropper. An enjoyable race an hopefully a regular venue for the future. Round two moves to Pipe Hayes Park, always a favourite. 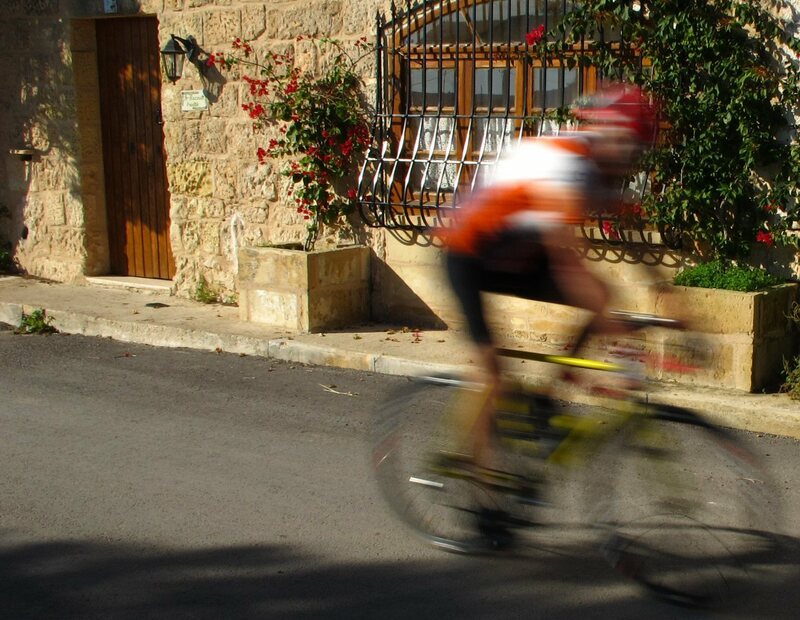 The first of the four mid-week TLI races took place on the Pinvin circuit. There were about 35 rider of differing abilities signing on. After a comprehensive pre-race briefing we set off from the HQ to ride to the start at Throckmorton Airfield a mile or so away. The race had been divided into three groups and I found myself (as a race virgin) in the Start Group. We were given a six minute start on the next group and a further three minutes on the elite group. As we started off, there were eight of us, a good sized group I thought and one that could work nicely together. The initial pace caught me a little as it was fast from the off. By the first bend we had already dropped four riders and so it was left to the four remaining riders to put on a show and try to stay away. At the end of lap one I was blowing somewhat and decided the only way I could hang on was to leave the other three to do the work whilst I rested for a while. Of course, I am not the sort of person to shirk responsibility so was soon back taking my turn. Lap two completed and we were still away. Could we do it? Everyone worked really well together, the two more experienced riders giving encouragement to the other two, we battled on. Once again I found myself having to take a rest at the back but grimly held on as I knew that if a split came it would be game over. We turned for the final time on lap three and one rider glanced back to report that the peloton was in sight! Could we make the bell before we were caught? With less than 500m to go until the final lap they came through like a steam train and we got spat out the back. We tried to hang on but it was no use, their speed was just too high for us and we watched them disappear into the distance. I could not keep with the pace and lost contact with my small team, finally rolling in a few minutes after them. It was a great race, most enjoyable, although my legs were far from happy. I&apos;m planning to ride again next Wednesday, and with my new race &apos;knowledge&apos; will be ready for battle. A group of eight of us headed down to the French Alps for some serious mountain climbing. Based near Bourg D&apos;Oisans which is at the base of the infamous Alpe D&apos;Huez we had five days of excellent climbing with stunning views, fabulous weather and awesome accommodation (www.chalet-michelle.com). Our climbs were; Col D&apos;Ornon(1360m), Croix de Fer(2067m), Alpe D&apos;Huez(1860m), Villard Reymond(700m) and the final day an outing along the valley. As a destination, it is straightforward - we flew to Lyon airport and had a transfer (2 hours) by the chalet owner. Everything is geared towards cycling. The chalet owner had some great advice (don&apos;t try the Marmotte! ), knew all the cycling routes and prepared excellent meals. There were plenty of cafes, bars and shops around and hundreds of cyclists, although, even on Alpe D&apos;Huez it never felt crowded and we did that on a Saturday. Definitely one for a return visit. This was the second year of the running of this event and is proving very popular indeed with several hundred cyclists riding one of three routes; Epic at 100 miles, Standard at 65 miles or Short at 24 miles. Once again I chose the Standard route and after negotiating the rather slow start system - 20 riders at a time were allowed out onto the road after receiving the usual Health and Safety briefing which meant a 20 minute wait in the queue. Luckily it was a warm morning. Soon enough though I was out and off with my little group of twenty riders. As usual, the split came quickly and I joined the leading group of six or seven, well, until the first bend where a couple of riders ahead touched wheels and &apos;bang&apos; down went a rider. Myself and another just about managed to avoid the crash. Luckily the guy was unhurt but a little shaken. I decided to move ahead to be out of the way of any repetition. The route starts in Worcestershire, passing through Bridgnorth, crossing the River Severn then into Staffordshire briefly, then Shropshire to tour around the Wrekin at about 40 miles, which is where the course gets its name. The latter county being easily recognised by the number of climbs encountered! Of course as with all Sportives, there are always riders ahead to be caught and today was no exception. There must have been at least two hundred start before me so I had plenty to go for. At times I would catch other riders, then ease off in the group for a breather before pressing on again, at other times I would pass at speed and not pause. I didn&apos;t get it all my own way though with groups catching me from time to time, although I did try wherever I could to jump on the back for a tow. The route setters though, must be commended for an excellent course that very neatly avoided most major roads but fiendishly included some testing climbs, including the climb out of Bridgnorth and the climb out of Ironbridge, reducing many to walking. A highlight for me again this year was Ironbridge and the Severn Valley which is steeped in history, although today it was also packed with tourists so a bit slow through the town - why is it that car drivers insist on overtaking a bike only to stop almost immediately and block the cyclist? The final big climb of the day comes at the end of the valley taking us out and onto quieter roads again for the final 15 miles or so back to the finish. A similar time to last year at just over four hours with a similar distance recorded and a medal handed out by Hugh Porter again made the day complete. Last year I said I&apos;d do it again, this year I&apos;m saying the same. Great course, great views, great company the sun has shone both times so no reason to think it won&apos;t be sunny again next time. Starting in Bakewell at the Showground is quite inspired - there is plenty of parking, good facilities and the town can occupy &apos;the better half&apos; for the entire morning! Setting off through the town we were soon out into the countryside with some nice long easy rides, a few easy hills and some very nice downhill. I always worry when the downhills are long - there will be a price to pay! Sure enough, we soon arrived at Grindleford and the first big climb of the day. The total ascent of this climb was 750 feet over a distance of less than two miles which is pretty good going by any standards. One or two thought better of it and were soon walking. Maybe they were sensibly saving their legs for later. After about 16-17 miles we arrived at the village of Hope with Castleton and the very big climb ahead. Having local knowledge I knew to take it easy along the road which is pretty flat at this point. Through Castleton and Winnats Pass comes into view as a carving in the hillside. Flags denoted the start of the 1.4 mile climb which was also billed as a Strava segment. In addition, the road was closed to all but cyclists which was sensible move as there were bikes all over the road including a good share of dismounted cyclists. Of course I had to ride without getting off which I managed (just) and arrived at the top, lungs bursting and legs complaining but stayed on and managed to get over the final small incline at the top to enjoy a downhill rest. Many stopped at the top for a break. My time was exactly 14 minutes which wasn&apos;t too bad I thought. The official Strava segment for the day claimed the fastest time being 8:44 so I was happy with my time. From there, the route continued Eastwards in an anti-clockwise direction through Peak Forest and Peak Dale then Dove Holes and onwards towards the outskirts of Chapel en le Frith at 30 miles. Past Combs Reservoir the route soon turned South but climbed steadily for the next five miles which meant a steady pace could be maintained although towards the top, fatigue started to creep in. From there the reward was a good stretch of downhill and almost into Buxton, but avoiding the town nicely which was good planning. Some good fast roads followed with other small country lanes. The interest level was always high and the scenery of course was excellent. After about 60 miles, we passed through Hartington Village which is one of my favourite villages in the Peak District - something it seems, was shared by about a thousand other people today with cars, motorbikes and cyclists everywhere. Pressing on, I joined a couple of other cyclists on the long five mile climb up, sharing the work until one of them dropped off the back and her buddy slowed to wait, leaving me on my own to finish the climb. From here we had a short ride into Monyash then a brief climb up before the long eight miles down into Bakewell and the finish. Post-race T-Shirts, goodie bars and medal were handed out and a nice easy ride back to the car. Starting and finishing at Oxford United Football ground, the course did an anti-clockwise tour of Oxfordshire to the West of Oxford, passing through some very nice villages (Goring, the Hannays and Ipsden) and passing beneath the White Horse at Uffington. The route mainly kept to reasonably quiet roads in the early stages but did include some major roads later on. It crossed the Thames a couple of times and also passed by the Ridgeway (hence the name). The Ridgeway is a long distance Bridleway running some 87 miles (by an amazing coincidence) from Avebury to Ivinghoe Beacon. At a billed 87 miles (actually 89) it was the longest ride I have done for some time so suffered a little over the last 10-15 miles - mostly sore arse, but the legs were also a little tired at the end. I managed 5:19:07 which put me in the Gold Standard so was more than pleased with that. Free T-Shirt, medal, water bottle and the usual gel-giveaways completed an excellent day out. The sun shone all day which was a bonus. Pipe Hayes Park was the venue for the final event of the season with a similar but changed course from last year. This time it was confined to the big field with a twisting, turning course that never allowed the rider to settle. Steadily downhill for the first section then twisting and turning back up again before entering the wooded section where the course must have gone around every tree! The weather was reasonably kind with a small shower beforehand and then more rain just after the V50 race had completed made the course slippery in places but not quite the mud-fest of other courses. The new venue of Middle Spernal was the host for this event. The land is owned by the Heart of England Forest Commission. An excellent course was designed combining grassy sections, a climb, a wooded area both up and down and a zig-zagging downhill section, being both slippy and tricky to negotiate, never allowing the rider to let go. Your reporter rode his first race for many months having been out of action for most of 2016 race wise so was happy just to finish! As a result of a well-spotted car washing service, the bike arrived home cleaner than it left so that was a result. Unfortunately the gear didn&apos;t which reduced the popularity of your reporter. Final race of the season is at the excellent Pipe Hayes Park course on the 29th. Tonight saw the season finale TT kilo sprint. Some hard racing in stunning early autumn weather. Jez smashed it again and another Pb from Matilda Pile. Didmarton near Tetbury was the venue for the Cotswolds Sportive organised by Evans Cycles and billed as a 34 mile undulating course. Having ridden their Road Sportive last year I was pretty sure it would be a reasonably flat course - I completed the 60 mile road version in under 3 hours which shows how flat it was! What a shocker! To say it was undulating is a bit like saying the Himalaya is a bit lumpy! We started easily enough riding along bridleways through fields which were easy enough, provided you didnt mind the track disappearing under grass and other growth. The first third was reasonable, then it got hilly and seemed to be planned to go up a very steep hill, only to descend the other side again. The ups were so steep that no-one I saw actually rode them and the downhills suited only the headcase Mountain Bike specialists. Luckily we were blessed with good weather so didnt have too much mud to contend with and the pit stops were well-stocked with food and drink. I managed a shade over 4 hours which included a 15 minute unplanned diversion where I missed the turning and recorded the 7th fastest time out of 87 riders on the long course - not that it was a race! Starting in the home of the pudding (or tart) - Bakewell, the Sportive wound its way around the Peak District for 47 miles using a combination of disused railway lines, country bridle ways and some quiet roads we circled around Bakewell, headed out to Monyash then South in the direction of Dovedale before returning along the Pennine Bridleway and some fiendish tracks and technical descents. Your reporter managed to get Three punctures during the ride which slowed progress somewhat and even resulted in riding the last couple of miles on a flat tyre. Many used mountain bikes, but there were some Cyclo Cross bikes in use (including myself) which was no disadvantage as the mountain bikers walked up the same hills that the Cross bikes did! An excellent course and one to be repeated in the future. 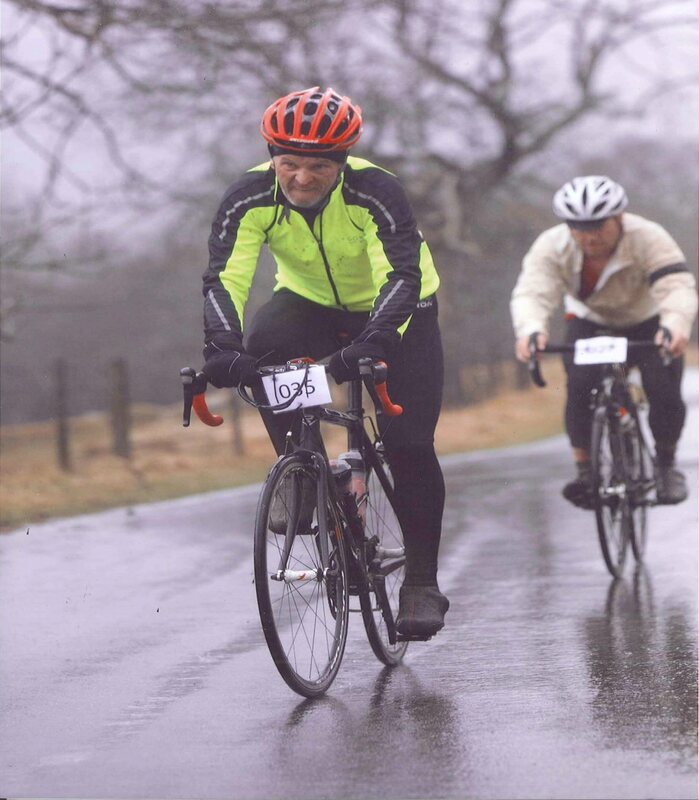 Compton Hospice held their annual Sportive on Sunday 22nd May. With a full field and three route choices of 25, 65 and 100 miles, there was something for everyone. Your reporter elected to ride the Standard (65 mile) course which wound its way through the undulating country roads of the Shropshire countryside and around the Wrekin mountain via the undoubted highlight of Ironbridge and Coalbrookdale, scene of the Industrial Revolution, without which we would all be on wooden bicycles! On hand to present the medals was none other than Hugh Porter, one of Britains most successful cyclists of the 60s and still keen to ride even in his 70s. If you wanted to pick one Sportive for 2017, you could do a lot worse than the Compton! Malvern Cycle sport rider Liam Killeen showed his class in VC Sevale’s latest Timetrial. Raced on the extremely challenging hilly Welland course, that sees riders tackle the climbs over British Camp and hollybush, Liam rode to victory in 32 minutes and 15 seconds. Two time National Road Series champion Nikki Juniper from Team Ford Ecoboost came in a strong second place, completing the course in 34 minutes 58 seconds. Martin Lines of Worcester St Johns finished in third place a further 2 seconds behind. Mike Amery collected maximum points in VC Sevale’s season long points competition by being the fastest club member on the night, stopping the clock in 36 minutes 5 seconds. Will Davies will be going out on another of his Monday evening rides to include a stop at a local Pub. The plan this Monday (9th) is to head off from Barnards Green bus stop at 6:30. A steady 30 ish miles later stop at the 3 Kings Hanley Castle. Weds 4th May ... Fun coaching session tonight for adult roady types... its off road but using a flat footy pitch so a mtb or touring bike / hybrid with good tread on the tyres will suffice. Non club members welcome, so if you have mates who might like to have some help with road riding let em know..
We will be doing group riding and etiquette etc.... nothing strenuous..
Bring a helmet and maybe a bottle of water etc... starts 7pm lasts approx 1hr. Location .. Peachfield Common footy pitch.... Malvern Wells. VC Sevale’s Jez Pile and Worcester St John’s rider Jason Milner tied for top spot in our clubs latest time trial. Held on the fast 10 mile Severn stoke course, both riders clocked an impressive 22 minutes and 30 seconds. Malvern Sevale rider William Davies came in third place, stopping the clock in 23 minutes and 18 seconds just ahead of fellow Sevale rider Mike Amery. So.... you are getting fit and getting fast but are you still fat? so how to lose it..
there is plenty of advice out there [ latest I have seen was in Cycling Weekly last week. ] but it appears the best plan for most of us is to lose it slowly and with proper planning and nutrition. Can I cut out the beers, cheese sarnies and chips..
12 riders braved torrential downpours and strong gusty winds to compete in VC Sevale’s latest 10 mile time trial, incorporating the Burford Cup for club members on standard road bikes. Guest rider Martin Lines (Worcester st Johns) was fastest on the night in a time of 23 minutes and 47 seconds with Evesham Wheelers rider Richard Young in second place in 27 min 1 sec. First home rider was William Davies who completed the Chance Lane course in 27 minutes 6 seconds, edging out fellow club rider Mark Webb by a mere 2 seconds. Malvern Cycle Sport’s junior rider Hattie Harnden rode strongly to finish in 7th place with an excellent time of 28 min 40 seconds. The competition for the Burford Cup, which is based on a handicap calculated from last year’s results, was closely contested with the first three riders separated by less than half a minute. Mark Webb was victorious, with Sean O’Toole in second place. Simon Barker completed the podium. Some great racing this weekend on the Welland 16 mile (ish) course. Saturday saw the LVRC take on the VTTA in a time trial. Club members William Davies and Mike Amery teamed up to ride in the team event. Despite Will&apos;s complaints that the lean Mike offers limited drafting, while his &apos;fuller figure&apos; acts like a wind break, the pair finished in 3rd place. Over all the VTTA won the trophy for this year. Velo Club Sevale rider William Davies won the Malvern cycling club&apos;s second time trial of the season, held again on the 5.5 mile Hanley Swan course. Colder weather with a stiff head wind on the final leg meant that many of the riders struggled to match the previous week&apos;s times but Will Davies bucked the trend and rode one second quicker to win in 12 minutes and 37 seconds. Coming a close second was club mate Mike Amery, who stopped the clock in 12 min and 48 seconds. Guest rider G Browning put in an impressive ride to complete the podium in 13 min 15 seconds. First lady on the night was Clare Grozier who completed the course in 15 min 57 seconds. Clare Turner came in second place a further 3 minutes back. 4th S O&apos;Toole 13:34, 5th S Barker 13:44, 6th J Bouchet 13:50, 7th M Collins 14:11, 8th S Adcock 14:25, 9th S Wyllie 14:40, 10th M Stains 14:42, 11th B Davies 15:05, 12th G Abbatiello 15:51, 13th C Grozier 15:57, 14th J Watling 17:12, 15th S Whitehead 17:16, 16th C Turner 19:17. Hanley Swan is the traditional first Club Time Trial series event of the year. Conditions were good if a little chilly and the event attracted 19 riders with Jez winning in a comfortable 12:06 from second placed rider H. Thomas from Worcester Cycle Centre in second with 12:22. Mike Collins took the honours in the Road Bike series but raised questions with his new wheels as to whether or not he still qualifies! Beer bribes may be required...Tony Knight was second Road Man with a good 14:27 which was 9 seconds faster than his opener last season. Jez Pile won his age category at the LVRC (veterans) track Omnium competition at Newport velodrome on 14-15 Feb. Jez won all three timed events (3k Pursuit, 750m Time Trial and Flying Lap) and placed highly in the three bunch races (Scratch race, Elimination and Points race) to beat his nearest rival by a comfortable 5 points. In the Flying Lap, Jez was the only rider at the event to cover the lap in under 15 seconds (60kph!). Mike Amery also rode in the event, finishing a creditable fifth in his age category. Will Davies had entered but was prevented from riding by a nasty chest infection. The Annual Dinner was another great success with 25 attendees enjoying a three course meal. The prize giving went well, check out the &apos;Prize Winners&apos; link from the Home page to see who won what. Highlights of the evening included Will Davies winning the &apos;Bridesmaid of the Year&apos; for his many second places in the awards, Mike Amery for the &apos;Arbitrary Finish Award&apos; and the unveiling of the proposed new Sevale Kit - a winner, especially with the Ladies! Book now for the 2016 season to avoid disappointment. The final round saved possibly the best course of the season! The mud of the previous couple of events was gone, but not totally, the course was pretty flat and fast through most of it, with fast straights, tricky twists and turns, some boards to dismount and jump and some technical stuff through the woods. As usual, organisation was top notch and it is a shame that the season is now finished. Roll on the 2016 season! Over 70 riders attended the annual Reliability Ride. Conditions were wet and mucky which was an improvement over the ice from last year. All riders completed the distance with some impressive times in the 50 mile ride of around 2 1/2 hours. The short course attracted a good entry with the pace and organisation being just right. Thanks to all those who attended and special thanks to the organisers, tea and coffee makers and bringers of cakes. Just when we thought it could not get any muddier, it did! When you are plastered in mud just getting to the start and cannot even ride your bike from the staging lane to the start grid because of the mud you know you are in for a mucky ride. The course was a shortened version of the normal course but still leg-sapping and requiring walking on many of the hills. Of course, that is why we do it so overall, exhausting but fun! An excellent turnout of a dozen riders, attracted by the good weather and the possibility of prizes. The competition went without a hitch, won this year by Ben Davies at his first attempt reaching the lower slopes of the bridge. Second was Tony Knight and third placed Sean and Kay OToole on their Tandem. Commiserations to Mike Amery who finished some 200m behind the rest of the field but made up for it with a victory in the post Downhill ride, although an official complaint from the second placed finisher (Mick Peakman) for what appeared to be an arbitrary change of finish line may result in a Stewards enquiry. Without a doubt, the muddiest race of the year! The Valley at Evesham was the venue and the course got steadily worse (or better) as the races progressed. In the Vet race, crashes happened at the first and second bends on Lap 1 with riders falling in the mud. The hills were unrideable or so slow that running proved to be much quicker. Some riders changed their bike after every lap. Luckily the venue had a power wash for the bikes. Round 9 at Bromsgrove was on the excellent Blackwell Court circuit in rather muddy conditions. It is a tough course with the usual twisty turns in the field and the long out and back section with a sharp couple of climbs followed by a long descent and an even longer slow leg sapping ascent. Round 7 at Henley in Arden was a tough but dry course twisting and turning through the main field then into the strength sapping far field where several ascents of a small hill proved a testing section. It was all rideable with no need to dismount at any point.More points in the bag and looking forward to Round 8 at Lutterworth on the 24th. Another excellent course, this time on Cannock Chase with a course that started with a long sprint to separate the field a little, then into the woods for some technical muddy stuff, out and back in again after a short track, then out again and into the spectator section which comprised twisting and turning designed to slow the riders and keep them concentrating. From there more technical stuff until the bomb crater and back onto lap 2. A great day with excellent weather. Round 1 of the Cyclo Cross season kicked off at Redditch with an excellent course which twisted and turned through the woods, adding a few steep climbs requiring all but the fittest riders to dismount.The weather was excellent and the going mostly firm but a few muddy sections tested the riders route choices - try to ride round or plough straight through. Average lap times were about 8-10 minutes so 5 laps for the fast boys and 4 laps for the rest in the Veteran race gave a good mornings racing. Round 2 moves to Shrewsbury. A reasonable turn out of 19 riders raced the first of the final two short 5.5 mile Time Trials. Conditions were not fantastic with a generally cold feeling to the air. 27 riders braved the headwind down to the Motorway and lack of tail wind back on an overcast and slightly rainy evening. Winning time was just under 22 minutes with Jez once again proving triumphant. A slightly over weight Will Davies rode a disappointing ride but is now back on a serious diet so will no doubt be challenging for victory soon. Finally back to Leigh Sinton now the road works are finished saw the riders on a very slightly shorter course (9.9m) as the decision was made to start on the main road rather than the lane due to the heavy volume of traffic. Some good times recorded which of course all count! Another good turn out with 17 riders competing. A mixed bag with some riders going faster than last week and some slightly slower. The winning time of 22:18 was 10 seconds slower than the previous week but the winner (Jez) was faster than his previous time. An excellent turnout from over 30 riders for the Inter Club event saw a winning time of 22:08 from WSJ and also Worcester taking the Club points win from Wyre Forest with Sevale in third and Evesham fourth. Overall Wyre Forest still lead the series with Worcester St Johns in second and Sevale third. 19 riders enjoyed the Kinnersley course with the final killer hill. The winning time was 23:12 by S Garrett. First home for Sevale was Will Davies in a time of 23:54 which gave him third overall. The road bike winner was Mark Webb in 25:00 with Mike Collins second in 26:40. A surprisingly low turnout of just 14 riders raced in the excellent conditions on this classic 10. Mick Peakman managed a sub 27:00 for the first time this season giving him a Gold standard. Mike Amery took first place in the Club competition. Good conditions saw Will Davies break the hour for the first time giving him third place overall to the WSJ pair of Millward and Lines. Mark Webb took the honours in the Road bike category closely followed by Mike Collins and Mick Peakman, the latter two having an excellent tussle over the final few miles alternating a lead neither one wanted to relinquish. Starting and finishing in the Shropshire town of Ludlow, the route winds its way through some of the best countryside that the county has to offer. With tea and lunch stops provided and the continuous sunshine it was an excellent day out and one that saw Sevale represented by John Baker and Mick Peakman who rode together for some of the 65 mile course but as with all Audax events it is at the riders own pace. Good conditions saw some good times with Jez losing out by just two seconds to N Preece who won in a time of 22:57. In the road bike category Mick Peakman took the honours from Mike Collins by just three seconds. Peakman claimed the victory after taking streamlining advice from Coach Price, which remains a closely guarded secret! 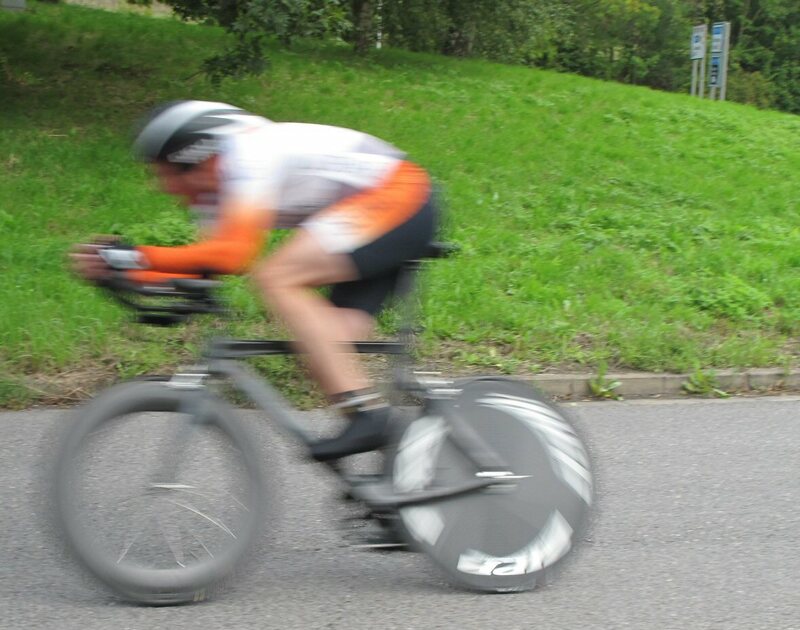 The Time Trial series moved to Severn Stoke, one of our faster 10 milers and with good conditions the first three riders were within 30 seconds of each other. An excellent result for Will Davies taking maximum points in 22:17. Sixteen riders on a nice summer evening with the wind in a reasonable direction saw Liam Killeen crush the opposition being over 3 minutes ahead of the second placed rider. A good result again for Mike Collins in the Road Bike category and just two seconds separated second and third placings. On a cold, wet, miserable evening, just eight competitors turned out for the Chance Lane 10. Just about the only highlight of the evening was the fact that there were almost as many officials as competitors! Martin Lines won in a time of 24:07 but the competition for the Road Bike Award was hotly contested with Mike Collins taking maximum points. Early summer sunshine and a slight breeze greeted 16 competitors in Malvern’s VC Sevale’s latest 10 mile time trial on the Severn Stoke course. Home club rider William Davies produced another strong ride for first place with a time of 22 min 41 seconds, a mere 4 seconds in front of fellow club member Jez Pile. Guest rider S Clarke came in third with 23:11 and VC Sevale’s Mike Amery claimed fourth with 23:12. Last Saturday saw the running of our Open 10 mile TT on the Severn Stoke course. 61 riders battled against extremely blustery conditions that made the ride extremely challenging. The eventual winner was P Gamlin from Northover VT who set a blistering time of 20 min 56. 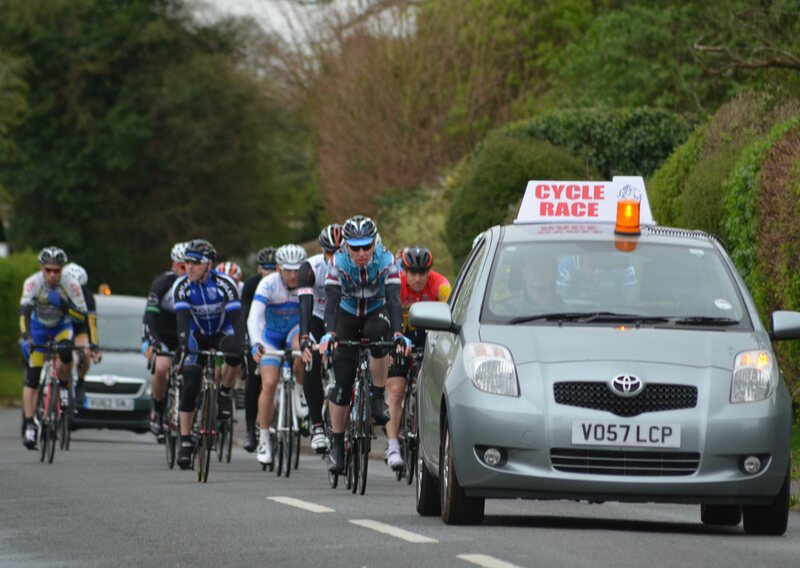 First VC Sevale rider was William Davies (17th) with a time of 22 min 59. It might have only be by 1 second, but Will was still extremely pleased with only his third ever 22 minute 10. Mike Amery was close behind with 23 min 48Other notable rides included 1st lady Libby McLaren, 1st Junior C Hibbert and oldest finisher V Jenkins (a youthful 74 years of age)A huge thanks goes out to all the Marshals, time keepers, cake makers, holderuppers and organisers that made the event safe and possible. Sixteen riders competed in velo club sevale’s season opening 5.5 mile time trial on the Hanley Swan course. Cold and overcast weather, coupled with early season legs made it a tough evening for all. Guest rider from Worcester St Johns, Jason Milner came in first with a time of 12 min and 33 seconds. VC Sevale’s William Davies recorded 12 min 41 seconds for second place with fellow club member Mike Amery 3 seconds slower for third. With the first three places separated by only 11 seconds it should prove to be a competitive season. The Contact Page now automatically redirects the enquiries to the relevant person depending on the reason for the contact. That way, we aim to respond to your enquiries quickly. Get in touch, the Sevale Team are here to help! Well, our new website has finally been released. We hope you like the new look and find it easy to navigate. Any problems or issues, please get in touch! The 2014 Prize Winners and new Course records set during 2014 (and there are a few!) are now available from a link on the home page. Also check out the About Us page for a link to the Committee page where you will find the committee members and minutes available for viewing. All of the Time Trial Records for Opens and Club Events have now been added. If you think you have a record that is not included - let us know! Last night at the Ale House in Colwall we gathered for the annual dinner and prize giving and a great success it was too. Notables were Jez winning the Senior series, Mike A winning the Veteran award and Steve Price named Club Person of the year. All in all a great night! We have now added the Course information book to the website so are now on the look out for a volunteer to take it on and complete it...any takers? All medals and trophies are now back from the engravers. All certificates are printed and Order of Ceremonies sorted. Speech written. If you havent got your tickets - what are you waiting for? We have now added the Calendar, the Time Trial Results Book and the Medal Times book! Also the Time Trial page has been rewritten and the links are beginning to be added. Exciting times! Wednesday 14th January is the last possible chance to get medal claims in - the engravers have already started work! All riders safely back with no incidents! All fed and watered with food left over. We have received several comments from riders, all of which were complimentary, so thanks for that! Look forward to welcoming you next year. 111 Riders signed on for the 2015 Reliability Ride - a club record! The weather was sunny but cold and a little wind. As I write, they are racing around Bredon Hill heading towards Tewkesbury and the return to Malvern. Get your Medal claims in for 10m and 25m as soon as possible otherwise you will miss out for this year. All awards claims must be sent to Mick Peakman, Club Secretary. A very Happy New Year from VC Sevale! Welcome to our new website. Please take a look around and let us know what you think! VC Sevale is based in Malvern in Worcestershire and promotes cycling within the county. We have an active calendar, starting in early January running right through until the end of September with a regular Time Trial series, organised Track Sessions and even hosting Road Races. During 2014 we staged cycling events to coincide with the Tour de France which will now become a regular annual event. We invite club members and guests alike to any or all of our events. You can get in touch either via email or phone for more information and we look look forward to seeing you at one or more of our events. All Photos used on this website are Copyright (c) VC Sevale and may not be used for any purpose without the express permission of the club.